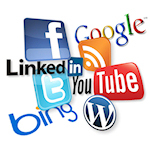 Social media marketing, like all things related to your Internet marketing, takes time and effort. It also takes a fair amount of precision “know how.” Throwing just any words on your Facebook wall, or posting from time to time compared to a consistent effort, is not going to do anything for your business. Actually, this approach is very likely to HURT your online reputation and therefore your business. There is really nothing “free” about social media other than a few registrations, logins, and passwords. You can find more excerpts from my book “1000 Things Every Business Owner & Manager Should Know About Internet Marketing” related to Social Media Marketing for small businesses here.